Is the ECB acting purposefully? Knowing that European political leaders cannot curb the ECB’s independence without violating their treaty obligations, Draghi took Eurozone politicians head on. He scolded them for their lack of progress on reform, demanded action and called for “[s]olid public finances and structural reforms and…. a much more robust economic governance of the union going forward.” Mindful of the ECB’s role in the ouster of Silvio Berlusconi, Draghi’s words have unusual impact. In short, the ECB is a central bank like no other. In this crisis it is a full-blooded political actor. As the sole institution that can affect financial markets, its influence goes beyond monetary policy and is unchecked by Eurozone politicians. As I explain below, the ECB is speeding toward a confrontation, not with Spain or Italy, but with France. Amazing that in a 1000 word essay dealing with the “Great Recession” induced hardship, the words money or monetary policy are not mentioned at all! Due to the fact that monetary policy went haywire? The stakes are very high here, and they are not just economic. As anger rises in today’s economy, I’m reminded of Thomas Jefferson’s words about the danger of “angry passions” arising between the North and South over the question of extending slavery to the Missouri territory. In an 1820 letter, he wrote that “this momentous question, like a fire bell in the night, awakened and filled me with terror.” He went on to predict, from his observations of such rancor, the secession of the South that was to come 40 years later. Versions of this story have been told several times by market monetarists (MM). Given that “the other side” insists in pushing the “conventional wisdom”, I feel free to concoct yet another version of the MM story. The economics profession has been appropriately criticized for its failure to forecast the large fall in U.S. house prices and the subsequent propagation first into an unprecedented financial crisis and then into the Great Recession. Note that there is no role for monetary policy in this “transmission process”. Actually, it´s worse because “excessively expansionary” monetary policy during 2002-05 is usually alleged to be a root cause of the house “bubble”. New Century Financial Corporation, a leading subprime mortgage lender, files for Chapter 11bankruptcy protection. Bear Stearns liquidates two hedge funds that invested in various types of mortgage-backed securities. 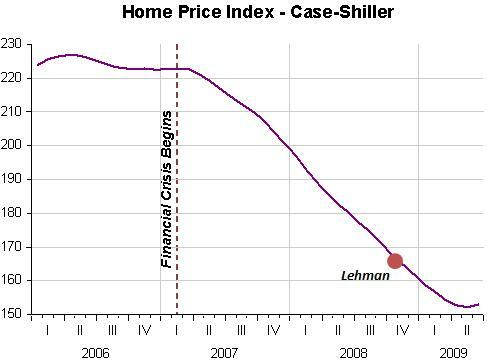 That seems right because it´s exactly after February 2007 that the Case-Shiller HPI begins its downslide. Apparently Freddie Mac´s decision to no longer buy risky subprime mortgages was instrumental in “popping the bubble”. 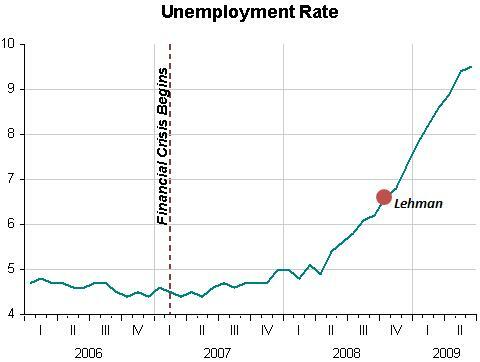 Despite that fact, the next picture indicates that unemployment remained low. At least until nominal spending began to fall in mid 2008. And why does nominal spending drop? Here´s where the MM viewpoint comes into play. The next picture shows that when the crisis began, velocity started to fall (money demand to rise). This was offset by an increase in the growth of money supply. As a result, nominal spending (NGDP) continued to rise and unemployment remained contained. 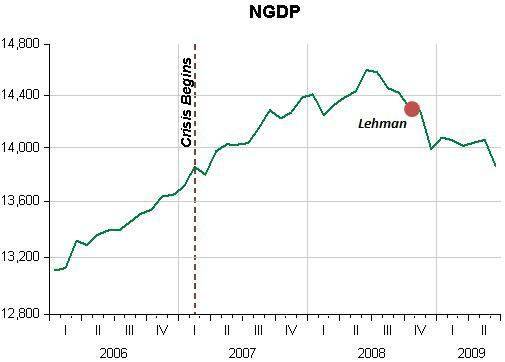 When, despite the continued fall in velocity, money supply growth reversed, nominal spending growth turned negative and the recession became “Great”, worsening the ongoing financial crisis (Lehman) from the fall in house prices. In this sense, the “Great Recession” is a monetary phenomenon. And we shouldn´t forget that the “depressive state” in which the economy remains more than two years after the official end of the recession is also due to the failure of monetary policy to give the needed boost to aggregate demand. However, the biggest failure was the complacency resulting from the apparent ease of maintaining financial and economic stability during the Great Moderation. Perhaps most important, as noted by some analysts as early as the 1990s, these adverse consequences of the Great Moderation were most likely to arise from the actions, judgments, and decisions of financial market participants. I gather from that that every once in a while policymakers have to “surprise the markets” lest it becomes “complacent”! In the choice of monetary rules, the Fed should aim at those that minimize the need for forecasting, such as Carnegie-Mellon economist Bennett McCallum’s nominal final demand rule or the variant of that rule proposed by William Niskanen in this Handbook (Chapter 36). An even simpler rule is to freeze the monetary base and let private firms supply currency in response to market demand, as proposed by Milton Friedman. Admittedly, this is an oversimplification. The accumulation of empirical evidence on monetary phenomena, improved understanding of monetary theory, and many other phenomena doubtless played a role. But I believe they were nowhere near as important as the shift in the theoretical paradigm. The MV=Py key to a good thermostat was there all along. If we write MV=Py as BuV=Py, where B is the monetary base and u the base multiplier, we can “link” the concept of “freezing the base” to the idea of targeting NGDP (Py). In this case the multiplier (u) changes to compensate for changes in velocity (V) in order to keep Py growing along a stable path. I would have thought that the experience of the 1930s argues against such a rule. If I recall correctly, most of the decline in the monetary aggregates during that period was attributable not to high-powered money but to inside money and the money multiplier. If we abolished the Fed and kept high-powered money constant, it seems that a similar set of events could potentially unfold. Do we need to keep the Fed around because the money multiplier might collapse again? Mankiw is right that the money multiplier declined sharply in the 1930s, but why did it? The proximate cause of the collapse in the 1930s was bank runs and fear of more bank runs. The underlying reason for the bank runs was geographic and note-issue restrictions that make US banks unnecessarily fragile. There were no bank runs and no money-multiplier collapse in Canada in the 1930s, which had neither restriction. 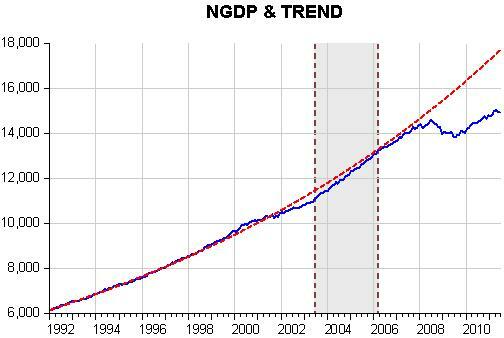 From 1987 to 2007 there was the “Great Moderation”, a state of affairs in which NGDP grew at a stable rate along a level path. Did “freeze the base” play a role? The picture below is illustrative. 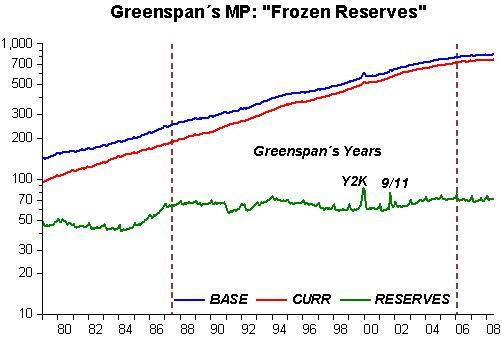 In it we see that after 1986 reserves remained essentially “constant” – note the Y2K and 9/11 “blips”. But the Monetary Base increased significantly, from 252 billion when Greenspan became Chairman to 804 billion when he passed the job over to Bernanke. That´s not consistent with any notion of “freeze”. But note that, since reserves remained relatively constant over the period, all the increase in the monetary base came from the rise in the currency in circulation component. In an age of ATM´s, debit cards and other technological improvements that economize on currency, it is clear that most of that increase in currency went abroad (including going into the “pockets of shady characters”). From those considerations, I believe we can approximate the notion of “freeze the base” with “frozen reserves”. 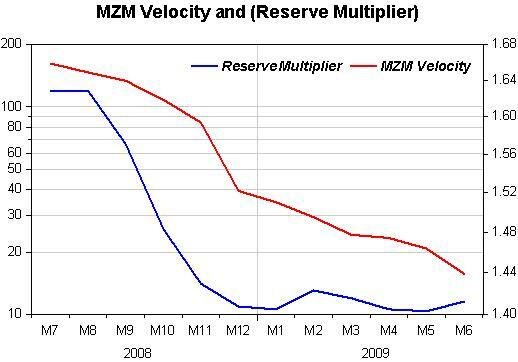 Since NGDP evolved along a stable path from 1987 to 2007, given that reserves were “frozen”, the multiplier must have changed to compensate changes in velocity (money demand). The following picture shows that for much of the time that´s exactly what happened. 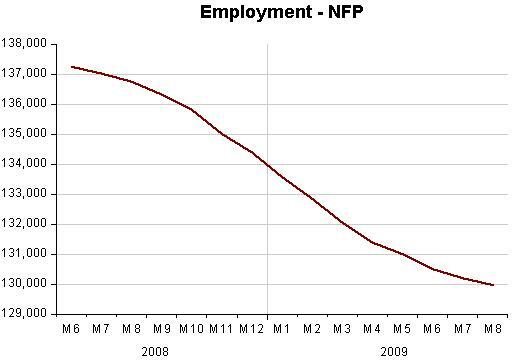 And the following graph indicates what happened after mid 2008. 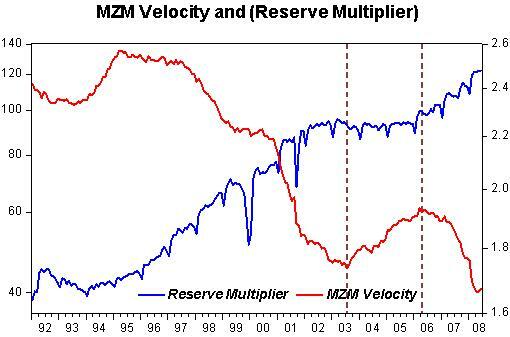 The Fed let the multiplier tank at the same time that velocity was dropping (money demand rising strongly). 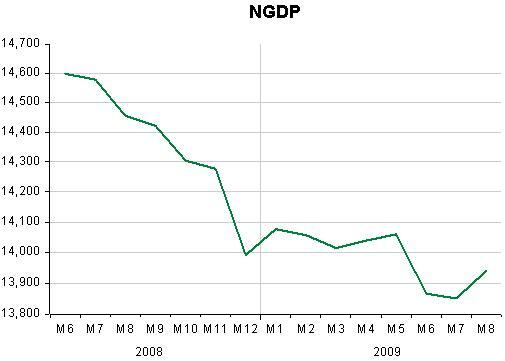 This was “engineered” by payment of interest on reserves, which “saved” the banks but “destroyed” the real economy (in particular employment), with NGDP taking a “dive”. The academic prestige attached to the lending-determines-spending doctrine and other credit-based macroeconomic theories is puzzling. [As noted earlier], Bernanke and Gertler include in their 1995 article the observation that comparison of actual credit magnitudes with macroeconomic variables was not a valid test of their theory. One has to wonder why. They claimed that bank lending was determined within the economy and so was “not a primitive force”…Bernanke and Gertler must have known that the relationship between credit flows and other macroeconomic variables were weak or non-existent, casting doubt on their whole approach. I can’t shrug off this flight from reality and responsibility as somebody else’s problem. I belonged to this movement; I helped to make the mess. People may very well say: Hey, wait a minute, didn’t you work in the George W. Bush administration that disappointed so many people in so many ways? What qualifies you to dispense advice to anybody else? In such a “revenge seeking” environment nothing can really work since any initiative will be torpedoed by one party or the other or, as in the “failure” of the “super committee”, by both! Which conclusion is more appealing? So what’s going on? Well, rather obviously, investors are a lot more worried about the credit of Greece — or Spain or Italy — than ours. Investors are also more worried about stock investments. Investors are also more worried about almost any other asset into which they might put their money. Investors also seem pretty sure that U.S.inflation is not going to be a problem anytime soon. If inflation scared them, they’d hardly let the United States lock in an interest rate of less than 2 percent for an entire decade. So then why isn’t it plausible to draw the following conclusion: that U.S. interest rates have been going in the “wrong” direction because investors are scared that the U.S. is going to reduce its debt and deficits, and such a reduction might horse-collar the world economy? But that’s not the only answer, or even the “best” one. Alternatively: US interest rates have been going in the “wrong” direction because investors are scared that the Fed is not going to try and bring NGDP to a reasonable level, and maintaining NGDP too low, while the ECB is doing the same, will (not might) horse-caller the world economy. There´s much I feel is quite wrong in this Kocherlakota speech (although I´m sure Steve Williamson would vehemently “applaud”). But I´ll concentrate on the last part – “Going forward”. However, the FOMC should do more than simply decide at each meeting whether or not to buy more assets or to keep interest rates low for longer. 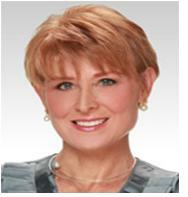 Any current decision is based on the FOMC’s forecast of the future, and no forecast can be perfect. The Committee should provide a public contingency plan—that is, provide clear guidance on how it will respond to a variety of relevant scenarios. For example, the Committee recently projected that in 2011, core inflation will be 1.9 percent and that it will fall back in 2012 and 2013 to around 1.7 percent. Suppose hypothetically that core inflation, and the outlook for core inflation, has risen to 3 percent by the end of 2013, while unemployment has fallen to between 8 percent and 8.5 percent. A public contingency plan would allow the public to know what the Committee intends to do in that eventuality. Sounds pretty complicated to me. Much simpler to state a specific target, say a NGDP level target, and strive to keep the economy evolving as close to it as possible. If for any reason it drops below or climbs above, everyone knows what the Fed´s action is going to be: put the economy back on the target path. I believe that public contingency planning will have many benefits. Let me mention two. First, in recent statements and speeches, I have described why the FOMC actions in August and September seemed inconsistent with the evolution of the macroeconomic data in 2011. This kind of inconsistency is much less likely to occur once the FOMC has formulated an explicit public contingency plan. Second, I’ve heard from businesses that policy uncertainty is curbing their incentive to hire or invest. Similarly, I’ve heard from consumers that policy uncertainty is curbing their incentive to spend. A public FOMC contingency plan can help reduce the level of policy uncertainty being created by the Fed. No contingency plan can ever be definitive. Inevitably, the FOMC will learn things that it did not expect to learn. And so there may be conditions that force the FOMC to deviate from a chosen plan. However, having a public plan, and couching its decisions against the backdrop of that plan, will enhance Federal Reserve transparency, credibility, accountability and consistency. As soon as you say that you are potentially expanding the “uncertainty space”, so it would not be of much help in reducing the “policy uncertainty that´s curbing incentives to spend and hire”. Importantly, FOMC actions in August and September that “seemed inconsistent with the evolution of the macroeconomic data in 2011” to Kocherlakota, may have seemed consistent (or inconsistent in an opposite sense) to other FOMC members. Again, “policy uncertainty wouldn´t be much reduced”. Much easier, again, to state an explicit TARGET (hopefully not for inflation or unemployment) and pursue it “tenaciously”. 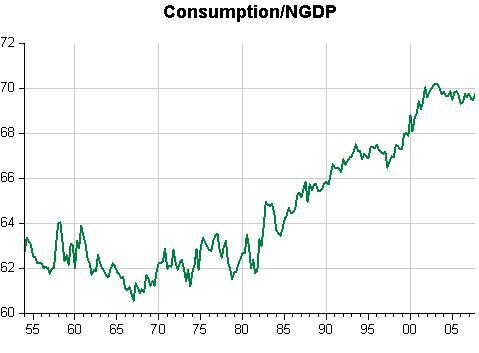 And always remember that an NGDPT level target was quite successfully, even if unwittingly, pursued by Greenspan for 20 years. When the Bernanke Fed, full of “inflation hawks” “abandoned” it, the result was “depressive”. The group fell short, however, of endorsing a full-scale shift in its targets for both inflation and unemployment, as Chicago Fed President Charlie Evans (who dissented in favor of more stimulus) has proposed. A more likely scenario is that we see the Fed start to shape expectations via a more loose and conditional form of inflation and unemployment targeting. We saw a prelude to this when Chairman Bernanke laid out the Fed’s forecast, which shifted the outlook for unemployment to fall in any meaningful way out to 2014, from 2013. The Fed also discussed nominal GDP targeting, which I prefer over Evans’s model. It just seems much more intuitive for markets to digest that the Fed is working to recoup losses endured during the recession, rather than raising the actual target on inflation. The Fed is struggling with a liquidity trap; there is a core consensus forming that the Fed must reassure the public and financial markets that it is committed to reflating the economy. The goal is to get consumers and investors to move out of the perceived safety of the Treasury market and make riskier, more productive investments in our future. It´s good that Charles Evans “proposal” didn´t get traction. Last year he was all about PLT. Now he “votes” for a higher inflation target and lower unemployment, as if there were an “exploitable” Phillips Curve just waiting to be “manipulated”. If the Fed is “struggling with a liquidity trap” it´s a “self inflicted struggle”. Bernanke knows that´s not an issue and even less a constraint (except in Krugman´s mind).Yes, the Fed “must quickly find a way to reassure the public and financial markets that it is committed”. Once again, for that to be effective it has to clearly state a TARGET. With that the “communications problem” essentially disappears. More broadly, a number of participants expressed concern that switching to a new policy framework could heighten uncertainty about future monetary policy, risk unmooring longer-term inflation expectations, or fail to address risks to financial stability. Several participants observed that the efficacy of nominal GDP targeting depended crucially on some strong assumptions, including the premise that the Committee could make a credible commitment to maintaining such a strategy over a long time horizon and that policymakers would continue adhering to that strategy even in the face of a significant increase in inflation. In addition, some participants noted that such an approach would involve substantial operational hurdles, including the difficulty of specifying an appropriate target level. In light of the significant challenges associated with the adoption of such frameworks, participants agreed that it would not be advisable to make such a change under present circumstances. If in the long run inflation is determined by money growth, if you specify a growth path for NGDP, how can you unmoor inflation expectations? Although financial stability is a separate issue, maintaining a stable path for NGDP avoids worsening any financial “instability” that can come about. 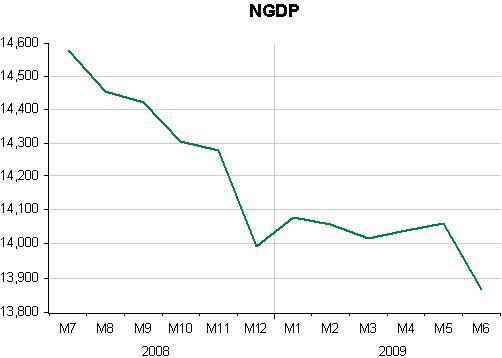 In 2008, when NGDP tanked financial problems went up exponentially. How can the Committee make a credible commitment? Remember than even without an explicit TARGET the Committee was credible for more than 20 years! As in 2 above, if the path of NGDP is adhered to, how can a significant increase in inflation (not defined as a relative price change, but as a “continued increase in the general level of prices”) take place? But it´s much easier to “fiddle with communication strategies”, even though without a TARGET they are just “empty words”.